Tales from a tribble: The Greatest Chess Game Ever Played? The Greatest Chess Game Ever Played? With the recent completion of the World Chess Championship last month in London, where the defending World Champion Magnus Carlsen of Norway, defeated his American challenger, Fabiano Caruana, I thought it appropriate to do this repeat post from a couple of years ago. Many chess experts have called the game played between chess Grandmaster's Garry Kasparov and Veselin Topalov, at the Hoogavens Chess Festival in Jan. 1999, as the greatest chess game ever played. This game, won by Kasparov with an incredible sacrifice of a rook. was great not just because of the amazing great moves by Kasparov, but also in the fact that Topalov, the loser, played well too. Kasparov didn't win this game because of a gaffe by Topalov, but he won it by making some incredible exciting moves. Even today, this game may still very well be the greatest chess game ever played. 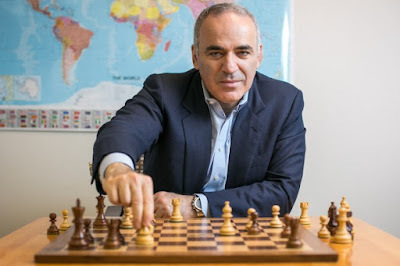 Garry Kasparov is the Russian [born in Baku, Azerbaijan when it was part of the old Soviet Union] Grandmaster who won the world championship of chess at the youngest age of 22 in 1985. He officially held the title until 1993. Grandmaster Veselin Topalov from Bulgaria, won the FIDE world championship in October of 2005. Garry Kasparov can arguably be called the greatest chess player in the history of the sport. Kasparov once had a chess rating of an unbelievable 2851. He won this exciting game in which he played the white pieces and Topalov the black. Hat tip to Mato Jelic on You Tube for this video and great commentary. This is great. I remember chess was very popular in the 1960's. My dad taught all the neighborhood kids to play. I still have a friend who thanks me for having my dad teach him to play and how important that was to him as a kid. Another friend went on to teach his son who went on to tournament play. A great game. Thanks so much for sharing Carolyn !